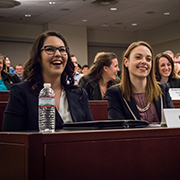 Emily Grand ’19 and Claudia Stantzyk-Guzek ’19 won the 2018 Bass Berry & Sims Moot Court Competition, held at Vanderbilt Law School Feb. 2, receiving the John A. Cortner Award and a cash prize for their win. 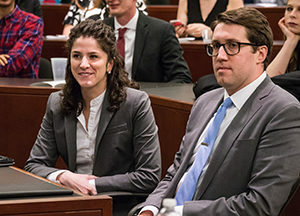 Grand and Stantzyk-Guzek faced finalists Josh Landis ’19 and Claire Fox ’19. The competition began last fall with 80 teams and a total of 160 participants. 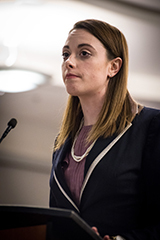 Landis received received the award for Best Oralist, and the team of Lauren Stern ’19 and Sarah Grimsdale ’19 received the award for Best Brief. Semi-finalists included 2019 class members Jenna McCarthy, Alex Peyton, Sara Anderson and Ian Joyce. 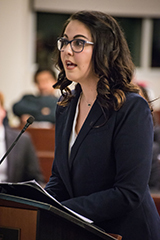 Under the leadership of Vanderbilt Moot Court Board Chief Justice Nell Henson ’18, Executive Justice Michael Buschmann ’18 managed a team of third-year students who organized and ran the competition. 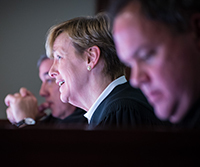 The competition’s final round was argued before a panel of three federal appellate judges, including Judge Debra Livingston of the U.S. Court of Appeals for the Second Circuit, who served as the round’s Chief Justice, Judge Gregg Costa of the U.S. Court of Appeals for the Fifth Circuit, and Judge Adalberto Jordan of the U.S. Court of Appeals for the Eleventh Circuit. (1) Does a reporter-source privilege exist under the First Amendment’s Free Press clause? (2) Is evidence that a jury chose to rely entirely on chance to determine its verdict admissible in a post-trial evidentiary hearing? The problem, written by executive problem editor Julie Rooney ’18 and associate problem editors Sam Mallick ’18 and Michael Tackeff ’18, followed the case of Gregory Brock, who wrote and directed a podcast detailing classified information provided to him by a government leaker. Citing a First Amendment-based reporter-source privilege, Brock refused to disclose the leaker’s identity during a grand jury investigation and was later convicted of criminal contempt of court as a result. After Brock’s conviction, however, a juror revealed that the jury had relied entirely on chance to determine Brock’s guilt using an application on one juror’s smartphone, an accusation confirmed by other jurors. The app, WhatsNxt, allowed jury members to essentially conduct a virtual coin flip by entering two options—Guilty and Not Guilty; the app then randomly generated the result–in Brock’s case, guilty. Brock’s appeal addressed both First Amendment protections for journalists who refuse to divulge their sources, and whether Brock should be granted a post-trial evidentiary hearing to argue for a new trial based on the evidence that his contempt-of-court conviction resulted from jury misconduct. Landis and Fox argued for the petitioner, Gregory Brock, and Grand and Stantzyk-Guzek argued for the respondent, the United States. The John A. Cortner Award, which goes to the winners of Vanderbilt’s annual Bass Berry & Sims Moot Court competition, honors John Cortner ’86, who served as the Moot Court Board’s chief justice. Cortner joined Bogle & Gates in Seattle after graduation, but was diagnosed with Hodgkin’s disease soon after and died within the year. His family endowed the award in 1988 in his memory.